The diagram shows the process by which electricity is generated in two types of hydroelectric power station. 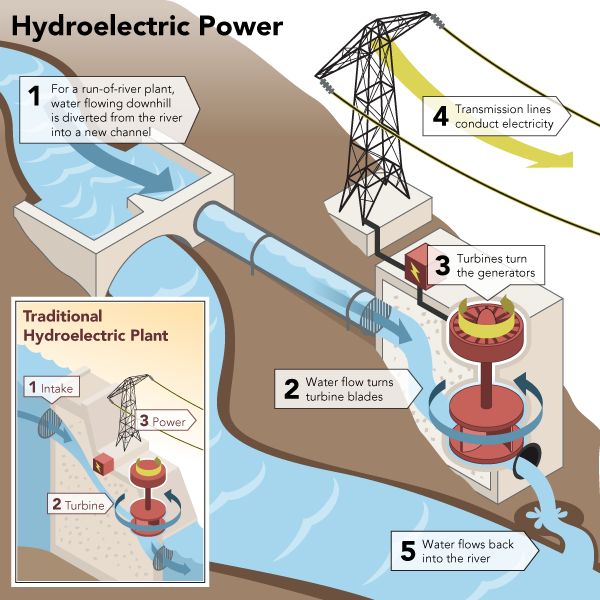 The diagram compares the process by which electricity is generated in two types of hydroelectric power station. Overall, electricity produced by a plant is traditionally produced in three stages, as opposed to in five stages at a run-of-river hydroelectric plant. In a traditional hydroelectric power plant, river water rises behind a dam until it is sufficiently high enough to enter an intake pipe near the top. Once it enters, the water flows down into a much lower turbine chamber whereupon it causes the machine’s blades to rotate, thus generating electricity. This power is then sent via transmission lines to customer’s homes. On the other hand, in a run-of-river hydroelectric plant, the natural flow of the water running downhill is harnessed to turn the turbine blades. Initially, water is channeled away from the water’s primary path down a pipe into a turbine building further down the hill. On entering the building, the water causes turbine blades to rotate which in turn spins a generator that produces electricity. This power is then conducted by transmission lines above the plant to where it’s needed. Surplus water then exits the plant and rejoins the river to resume its original course. Describe what you can see. The intake pipe is near the top of the dam, so first the water must rise and flow into the pipe in order for it reach the generator at a lower level. As soon as it enters, the water would flow down the pipe into the turbine chamber where it would cause a turbine’s machine to rotate and generate electricity. The traditional hydroelectric planet is compared with a run-of-river electric planet for explanatory purposes. Explain the purpose of each stage when necessary. “on entering” means when the water enters. The diagram compare the process by which electricities generating in two type of hydroelectric power station. Overall, electricity produced by a plant is traditional produced three stages, as opposed in five stages at a run-of-river hydroelectric plant. In traditional hydroelectric power plant, river water rise behind dam until it is sufficiently high enough to enter an intake pipe near the top. Once it enter, the water flow down into a much low turbine chamber whereupon it causes the machine blades to rotate, thus generate electricity, this power is then sent via transmission lines to customer’s home. On the other hand, in a run-of-river hydroelectric plant, natural flow of the water running downhill harnessed to turning the turbine blades. Initially, water is channel away from the water’s primary path down pipe into a turbine building further down the hill. On entering the building, the water cause turbine blades to rotating which in turn spins generator that produce electricity. This power is then conducted transmission lines above the plant to where it’s needed. Surplus water then exits the plant and rejoin the river to resume its original course. In a traditional hydroelectric power plant, river water rises behind a dam until it is sufficiently high enough to enter an intake pipe near the top. Once it enters, the water flows down into a much lower turbine chamber whereupon it causes the machine’s blades to rotate, thus generating electricity, this power is then sent via transmission lines to customer’s homes. Water channeled into a pipe → flows into turbine room → rotates turbine blades → spins generator →produces electricity.